The Gentle Leader Easy Walk Harness is easy to fit, easy to use and stops leash pulling quickly and comfortably, without choking your pet. Dogs and their owners love it! 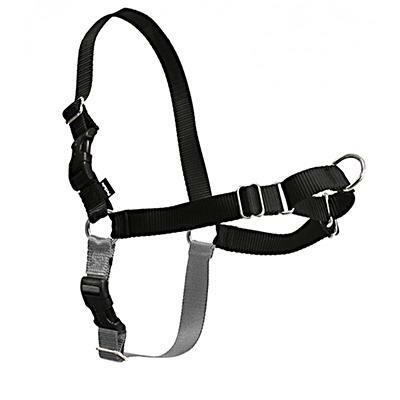 Two quick snap buckles-one on the shoulder, one on the belly-makes it easier to get the harness on and off. Soft nylon and 4 adjustment points provide custom superior fit and maximum comfort. Unique martingale chest loop reduces gapping and redirects forward motion. The belly strap is an convenient different complimentary color which allows you to tell up from down easily. Why it works: Traditional harnesses can actually encourage dogs to pull harder because of the "opposition reflex." That's the reflex that makes sled dogs do what they do. The Gentle Leader® Easy Walk™ Harness redirects the pressure through the front leash attachment. And, our patent pending martingale closure tightens slightly across the chest and shoulder blades when your dog attempts to pull forward. Extra Large size girth adjusts from 34 to 46 inches. Suggested breed sizes are Giant breeds and over-sized dogs.